Becoming a member at RAC is much more than access to over 30 fitness classes. It’s more than one-on-one training that’s motivating, not intimidating. It’s more than top-of-the-line equipment and rejuvenating amenities. When you’re with us, you’re part of our RAC community. There’s a class for everyone at RAC. Filter by category, instructor and time of day to find the one that works best for you. Sign up for two free one-on-one training sessions. In session one, you'll meet with a trainer where you'll discuss your goals and learn about the equipment. Session two will be your first training session where you'll discover the true benefits of training with an expert and motivator. Offer applies only to members who have not previously taken part in our one-on-one training program. We offer many incentives for businesses in the area to help their employees get fit or stay fit. Learn more about our Corporate Discount Policy or see how your business can qualify by contacting Membership Sales & Service at (269) 927-1129 or info@racbh.com. Whether you’re the bride, groom, part of the wedding party or a wedding guest, you can stroll down the aisle with confidence, thanks to this intense workout. These member-exclusive classes meet two times per week. Each week, additional workouts will be suggested to help you stay on track outside of class. The six-week camp is $250 and the 12-week camp is $450, with limited spaces for up to six members total. Sign up five other members and the bride attends for FREE! Plus, get one FREE personal training session for each person in your party. When you work with a personal training enthusiast at RAC, you're with a mentor, a coach and a friend whose motivation is to help you achieve your goals. 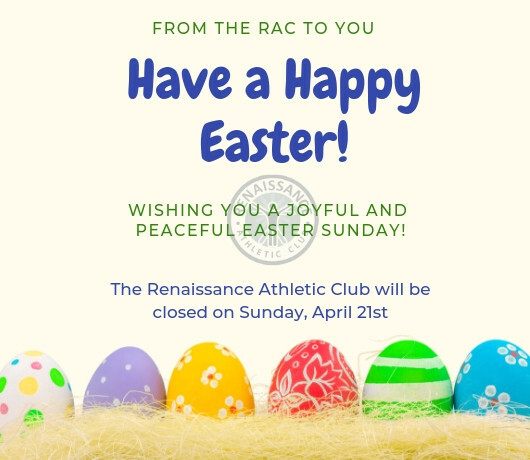 See all the buzz behind what’s happening at RAC.